Known as "yellow jackets" in USA, The common wasp (Vespa Vulgaris) and the German wasp (Vespa (or Vespula) Germanica) are guilty of much robbing of honey stores in bee hives and are a nuisance in the Autumn when there are few caterpillars for them to feed on. However traps can be simply made using materials that are to hand. The drawing at left shows the general idea in cross section. The container is a screw topped jar (honey jar or the like). The cone that is soldered into the jar top is a brass WBC type, but any similar cone will suffice. I have seen versions that have an "X" cut in the lid and the resulting four triangles are bent inwards to form the cone (care should be taken that the critters cannot escape through the triangular slots that are formed by this method). 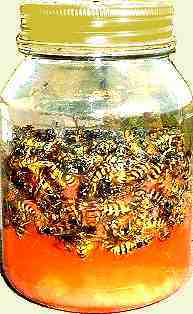 The fluid that half fills the jar is nothing more than jam dissolved in water and serves both as an attractant and as the media in which the wasps drown. I am not sure why honey bees are not attracted to the sticky sweet liquid, but they are not. I can only remember having seen one bee in such a trap and that was about fifteen years ago. The picture at right shows a successful catch. The first of these has been refined from an idea published by David J. Heaf. Which in turn came from a post to the "Irish list" [Message 11043 by Christopher Jackson, repeated below] David's version uses a plastic mineral water bottle that holds 5 litres, two 32 mm holes are pierced into opposing faces, through which a piece of PVC plumbing waste pipe is placed. The holes can be cut slightly undersize, then by using a deburring tool, material can be removed from the rim of the hole, so that the tube is a push fit with sufficient grip to render the need for glue unnecessary and give a smooth edge to the hole. The waste pipe has three 12 mm holes drilled in a row facing downwards. The illustration below shows such a tube 'upside down' for clarity. The attractant and drowning liquid, in the case of the original recommendations, being about half a litre of water with 55 gm of sugar, a few teaspoons of jam or honey and a pinch of dried or fresh yeast. As I have installed the entrance tube further up the container than on the original design, there is a greater volume of space for dead wasps to accumulate and as a result I would recommend a litre or more of fluid. The best attractant to put in a wasp trap is not jam but a 50:50 mixture of honey and water. Leave this mixture for at least 24 hours to start fermenting and then use it in your trap. Bees are not the slightest bit interested in fermenting honey, but it will attract every wasp in the vicinity. A capture rate of one wasp per minute is not unusual. A very successful design for a wasp trap (courtesy of John Chamberlain, Wiltshire bee farmer) consists of a large transparent plastic sweetie jar (free from your local sweet shop). Cut a piece of plastic waste water pipe of about 1.5 inches (35 mm) diameter and about 2 inches (50 mm) longer than the diameter of the sweetie jar. Cut 2 holes the same size as the pipe on opposite sides of the jar, about half way up the jar. This can be done with scissors. Drill 3 holes of about one third of an inch (8 mm) diameter in the plastic tube about 1 inch (25 mm) apart. The holes should be in a line but don't drill right through to the other side. Then push the pipe through the holes in the jar with the holes facing down. Put about a pint (500 ml) of the fermenting honey mixture in the jar. The aroma will rise through the 3 holes and exit through the ends of the pipe. Wasps will easily follow the aroma and crawl down through the holes but are unable to escape. We set up one such trap yesterday evening and placed it on the roof of a hive which was under serious attack by wasps. By 10 am this morning there were more than 200 drowned wasps and not a single bee. Another type is currently being developed by Simon Rees, he is using cones fabricated from expanded metal... His version of wasp trap is based on cones made from a 200 mm disc of 'expamet', he used a dinner plate as a template. The disc is cut in half and each resulting semicircle makes one cone. The cones end up about 110 mm in diameter with a hole at the tip that is of the order of 11 mm, they need to be carefully shaped so that they are properly circular in order to produce no gaps between jar and cone. The join is effected by stitching the butting edges together with loops of wire. He is unhappy about the sharp edges that occur around the rim, but judicious use of tin snips and a file can overcome this. The one Euro coin is included for size comparison. The cones sit point downwards in the mouth a large jar with some diluted fermented honey in it. 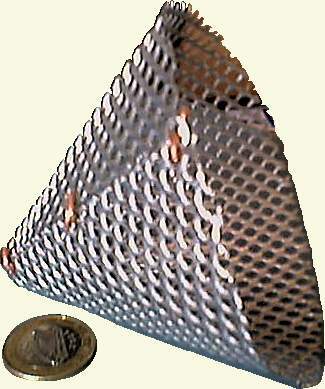 Expanded metal mesh, a short length of stiff wire to fix the edges together, suitable jar. Snips to cut the expanded metal, narrow nosed pliers to manipulate the cone into shape, hammer to tidy up any very rough edges, a file for more detailed tidying up, thick gloves for protection while the jagged parts are unfinished. The variations in design serve to illustrate that it is the principle that matters rather than the precise implementation of it, I can explain that quite simply by taking a plastic soft drinks bottle of any size... Discarding the cap, and cutting all around just below the neck. The neck is then reversed into the bottle and held in place by stapling with a standard stationary stapling machine, part fill with a sweet liquid of some sort, hang up with a piece of binder twine and you have a functional wasp trap. I have even heard that an empty wine bottle with jam and water liquid will work fairly well, certainly trapping an adequate number of wasps.